Necrotic leaf blotch is a common but minor disease that appears to be restricted to the Golden Delicious cultivar of apples and its sports. The disease is a physiological disorder and has been observed for about 20 years in most apple-growing areas of the Eastern and Midwestern United States. Leaf blotching, followed by severe defoliation, has been observed on Golden Delicious throughout North Carolina and in most of the major apple-growing regions in the Eastern United States. The importance of this disorder varies from orchard to orchard and, more importantly, from year to year. The disease is fairly common throughout Ohio. Figure 1. Necrotic leaf blotch on Golden Delicious apple leaves. Necrotic leaf blotch usually appears in late June or early July and is most severe in the latter part of the growing season. Mature leaves from the base to the center of upright, succulent, rapid-growing shoots are usually the only ones that show symptoms. Young, immature leaves on succulent shoots and mature or cluster leaves on fruiting wood are usually not affected. The effect of the disease varies among individual Golden Delicious trees, both from orchard to orchard and from tree to tree within the same orchard. The symptoms are a leaf blotching, followed by a yellowing of the affected leaves (chlorosis) and defoliation. Defoliation can be severe. Irregular brown blotches, usually 0.5 to 1.5 centimeters in diameter, suddenly appear on leaves. The blotches are usually restricted by the larger leaf veins. Many affected leaves turn yellow and drop all at once a few days after the necrotic blotches first appear. The most conspicuous symptom of necrotic leaf blotch is the large number of yellow leaves, on the tree and later on the ground, that suddenly appear during July and August. A distinctive characteristic of the disease is its appearance in two to four, or more, waves of these symptoms during certain periods that are scattered throughout the latter half of the growing season. Between these periods or waves, little or no additional disease develops. During the course of the season, 10 to 50 percent defoliation may occur on severely affected trees. All sports of Golden Delicious on any root stock appear to be equally susceptible. Necrotic leaf blotch of Golden Delicious apples appears not to be caused by a fungus, bacterium, air pollutant, or a nutrient deficiency. The causal agent of necrotic leaf blotch is unknown; therefore, the disease is often referred to as a physiological disorder. The disease commonly appears during hot, hazy weather following a humid, rainy period. Other environmental factors or an air pollutant may be involved. The levels of ozone or sulfur dioxide in the air and foliar nutrients in the leaves have little or no effect on disease development. It has been observed that certain fungicides result in less necrotic leaf blotch. Since a fungal pathogen does not appear to cause necrotic leaf blotch, it is difficult to assess the role of fungicides in reducing necrotic leaf blotch. The effect may be indirect, by altering leaf physiology. Fungicides containing zinc (Zn) ions appear to be the most effective. 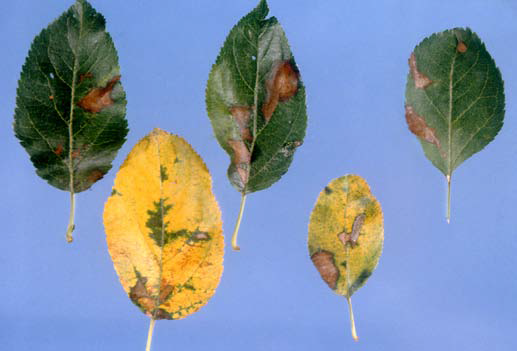 Golden Delicious trees sprayed, during the summer cover spray period, with fungicides containing mancozeb (Dithane M-45, Manzate D, Penncozeb) or Ziram tend to have less necrotic leaf blotch than unsprayed trees or trees sprayed with other fungicides. Trees that have an annual moderate crop of fruit have less necrotic leaf blotch than trees that have a biennial bearing habit or a light fruit crop. Golden Delicious trees pruned to a central leader commonly have less necrotic leaf blotch than trees pruned to an open center.